Do you know how to sew?? If you do, consider yourself lucky and madly skilled! If you don't... girl, I feel your frustration! I've always thought that because I didn't know how to wield a needle and thread, I couldn't alter my clothes. I thought a needle and thread was the ONLY way to make alternations, that is, until I started experimenting... with SCISSORS. Do you remember when I turned my too-small-denim-jacket into a denim vest? If you missed that post, you can click HERE and see how easy it was. And you KNOW I'm always cutting the necks out of my crewneck t-shirts! Because let's be honest... crewneck t-shirts, in most cases, are not flattering. Today I'm going to add to my scissor-alteration-repertoire, by showing you how I transformed a too-small J.Crew crewneck cashmere sweater into a cutie-pie-cardigan! As you can SEE here, the sweater is a wee bit too small for me. Even when I'm perfectly still, my belly is peeking out from under the waistband, so you know that as soon as I move, that thing is gonna pop up like one of those suction-cup-poppers. AND, the too-tight-crewneck really emphasizes my triangle body shape, making my hips look wide RELATIVE to my torso. Since I picked up this sweater for FREE at a clothing swap, I figured I had nothing to lose by CUTTING IT IN HALF, to see how it would work as a cardigan! So that's exactly what I did. With my son's $1 kid scissors. And you know what, when I hand-washed the sweater, the cut-edge just rolled right in on itself. It didn't fray, frizzle or fall apart. Not only does the sweater fit my body better now that it's not so tight, but it also helps balance out my proportions! See how my hips look balanced with my torso? If you've got a too-small tight-knit cashmere sweater sitting in your donation pile, try cutting it in half to see how it might work as a cardi! I mean, you've got nothing to lose* by trying, right? Now that I know how successful this little trick is, I'm going to keep my eyes peeled for honey-I-shrunk-the-cashmere sweaters at the thrift store! And to be honest, I like the cut, raw edge better than I do buttons. It feels a little more gritty/creative/edgy, and I kinda like those feelings! What do you think? Would you try this trick at home? And can you do me a favor... LEAVE ME A COMMENT with YOUR favorite closet-hack! Maybe I'll try it at home, write all about it, and thank YOU for the inspiration! PS. Gals, this is just a little reminder that YOUR BODY IS NEVER THE PROBLEM. 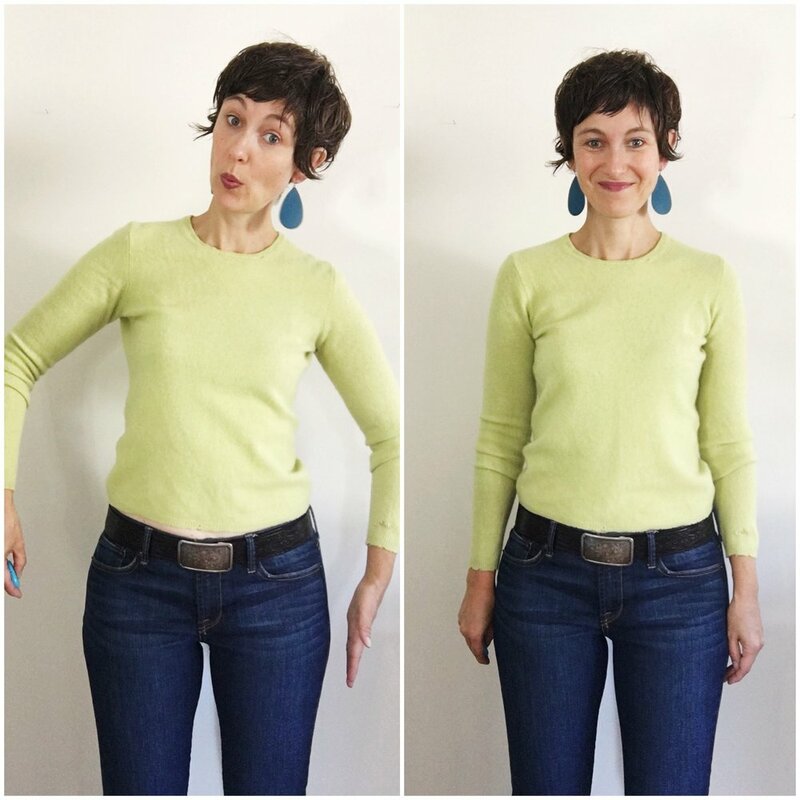 I was feeling wicked-hip-heavy in the crewneck sweater, but as soon as I cut it in half, and balanced out my proportions, my hips felt curvy and delicious! Whoa, right! If, for even one second, you wish your body were different than it is, then I'd suggest you consider signing up for the next round of Stasia's Style School, so you can put that nonsense behind you, and learn to appreciate and dress your body, just as it is! *Any alterations you make are done at your own risk. I shall not be held liable.